Ok. Let’s be real today. Let’s talk about food and the holidays. It can be a touchy subject for some of us and it can also be the source of guilt and negativity toward ourselves. And a lot of it has to do with restriction or not truly allowing ourselves the foods we really crave during the season. We will start with what used to be how I maneuvered the holiday season.For years, I wasn’t a huge fan of the holidays. Why? Because this was the season I would be ‘tempted’ by all of the no-no foods; foods I ‘shouldn’t’ have according to my food rules. I was the one who read all the magazine articles that would talk about how to ‘not give in’ or how to substitute a healthier version of what you really want. You know, the lower calorie, ‘healthier’ version or just something completely different to at least try to satisfy your sweet or salty craving. But guess what? It never worked. I would try so hard to avoid the foods I really craved because they weren’t healthy, but then I would do one of two things: either take one bite and then go crazy and binge on everything, or I would eat everything else to try to not eat the foods I craved that it just defeated the purpose. And you guessed it, after it all, I was still not satisfied, typically not feeling very good at all physically, and then left feeling guilty for my lack of ‘self control’ or ‘will power’. And that was my reality. And it was not fun, not fun at all. But over time, it started to dawn on me. You know what? I thought to myself. The thing that is not healthy is refusing to eat the things I want and crave, regardless of whether they have sugar or refined white flour or whatever was the no-no food of the season. This pattern was only making me more dissatisfied with myself and feeling less and less like I was having any fun during the most wonderful time of the year. I can guarantee that this season will be full of treats and desserts and so many delicacies that are not around any part of the year. And I can guarantee that if you use all of your energy to stay away from these things, well, then you will most likely find yourself in a pattern that will make you all the more miserable. This season, eat, drink and be merry. Toss out the rules. Toss out the guilt. Let it all go. Listen to your body and determine what you really want. Don’t try to substitute something else for that sugar cookie or the slice of pecan pie. So you love a good green bean casserole? Don’t go out hunting for the healthiest version you can find that tastes nothing like the version you love. That is how you can be healthy this season. Don’t skip the egg nog to ‘save calories’ and opt for something else. Have the d#$@ nog! Find gratitude for the wonderful treats and delightful times you get to experience and the rest will fall into place. Experience it all. 100%. And you too can have a holly jolly Christmas! 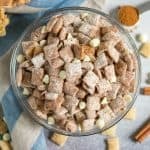 I bring this all up today because almost exactly a year ago, I brought you another Puppy Chow recipe. 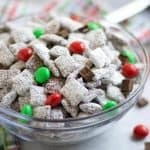 The recipe, which will be modified soon was called “Clean Eating Puppy Chow.” My goal of this recipe was to make a ‘clean,’ healthier version of one of my very favorite treats during the holidays. And the one ingredients I refused to use was powdered sugar as I was trying to avoid any refined ingredients. Well, I can definitely say the recipe was yummy, but it certainly wasn’t the same. I learned that you can make powdered sugar using coconut sugar, but again, the white stuff is really where it’s at. 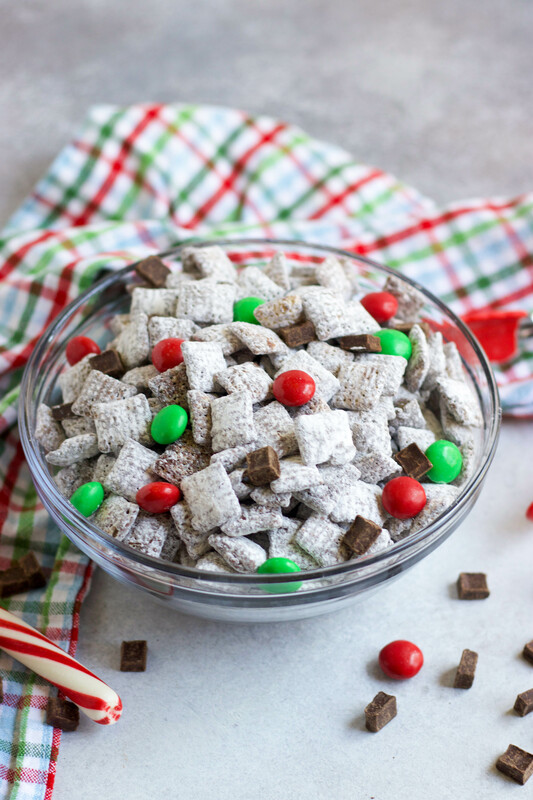 So this new recipe, Dark Chocolate Peppermint Puppy Chow, is a sign of my own growth around intuitive eating and letting go of the restrictiveness of the term ‘clean eating.’ As I have mentioned before, Clean Eating is still just another diet disguised as healthy eating. The great thing about this new recipe, aside from it being so stinking easy to make, is that it is such a fun and festive treat to give as gifts! Put it in a mason jar with a bow or ribbon and you are set! And if you show up to the party with a giant bowl, well then you will certainly be the life of the party. It’s a guarantee…well, something like that! The mint M&Ms are optional but I love the color it adds. I started out making this saying, “I will NOT add anything with food dyes…” but then I stopped myself. Yea, they aren’t the greatest maybe, but again, NO RESTRICTING. The second I say no to something is the second I want it all the more no matter how hard I try to find a substitute. So we have M&M’s and they are delish! I used real butter in this recipe. If you need a dairy free or vegan version, just sub either coconut oil or a dairy free butter. You should still be good to go! So sit back, relax and enjoy the holidays. And please, be easy on yourself. I spent enough time not doing so and hope that you can avoid finding yourself in that same place. In a medium sized bowl, add rice chex and set aside. Combine butter, 1 2/3 c dark chocolate chips, peppermint and vanilla over medium heat. Stir constantly until melted. Pour mixture over Chex and stir to combine and evenly coat cereal. Add mixture to a large ziploc bag and add powdered sugar. Shake well to coat. Transfer back to bowl and chill for about 10-15 minutes before serving. Toss in 1/3 dark chocolate chips and M&M's if desired before serving. We’ve been through two batches in two weeks. And that was with me trying to ration somewhat. Haaaa!!! It’s sooo good! Such a fun and festive treat for the holidays! So easy to make and great for food gifts! Yes, you will never go back! 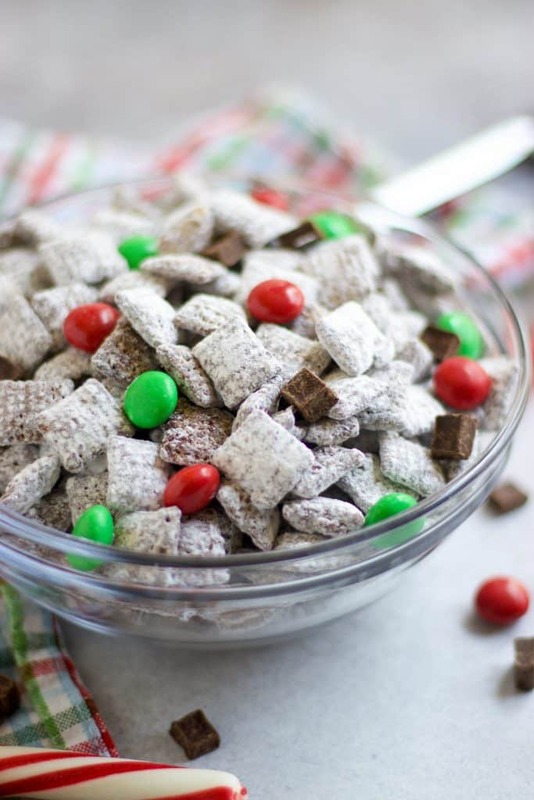 I actually have some dairy-free M&M-like candies, so I might be able to make this – just need to pick up Rice Chex! Oh yes!!! Where did you get them? Made this last year and can’t wait to make it again this year! Oh yes, it’s a new tradition here as well. Enjoy!! This recipe screams holidays! The whole family enjoyed this sweet treat and requested I make more ASAP!!! We are on our second batch over here! I bet the coconut oil adds an extra level of amazing flavor! so so so good, that’s all you need to know. My dream dessert! I can’t wait to make this again this Christmas! Enjoy! We live on this stuff!!! You know the way to my heart. I love Puppy Chow!